At Little Northern Bakehouse, we love the authenticity that comes from properly enjoying delicious gluten-free baked goods. Of course, we’re all about the goodness of real food, but we also live gluten-free when we aren’t munching on avocado toast (and considering how much avo toast we eat, that’s a lot of extra time). Check out these lived-and-learned tips from our staffers on how to get the most out of your GF life. Obviously, this starts with loving the heck out of your allergy-friendly Little Northern Bakehouse foods, following us on social media, and signing up for our newsletter so you can get crazy-delicious and indulgent recipes, plus tips for living your ultimate gluten-free life! There are so many amazing gluten-free products out there and nearly always a swap for whatever you’re craving. On the example list: our amazing gluten-free bread (obviously), rice pasta and noodles, cheesecakes (thanks Daiya), tamari (soy sauce), etc. Check out our pantry staples list for more. Think about it: it’s literally their job to show you the latest and greatest in gluten-free living. We love following them for meal inspiration. Gluten can be hiding in some sneaky places, including bouillon, pickles, and even hot chocolate mix. Always look for gluten-free certification, not just a wheat-free mention. Making an index of gluten-free foods or ingredients that you can keep adding to is a big help to future you and anyone else trying to feed you. Whether you throw a party or hang out at one, there’s nothing better than asking everyone to bring something (plus their recipe) to a gluten-free potluck. Instant food crowdsourcing. Our recipe archive is also a great place to start. Offer to bring a gluten-free dish whenever you’re invited to eat at someone else’s place. While more work for you, at least you know that no matter what, you’ll have a gluten-free dish, plus, it helps take the pressure off hosts who aren’t sure what to make. Gluten-free living definitely has its trending moments, and that can yield some pretty delicious foods that are still full of sugar, salt, or are overly processed. 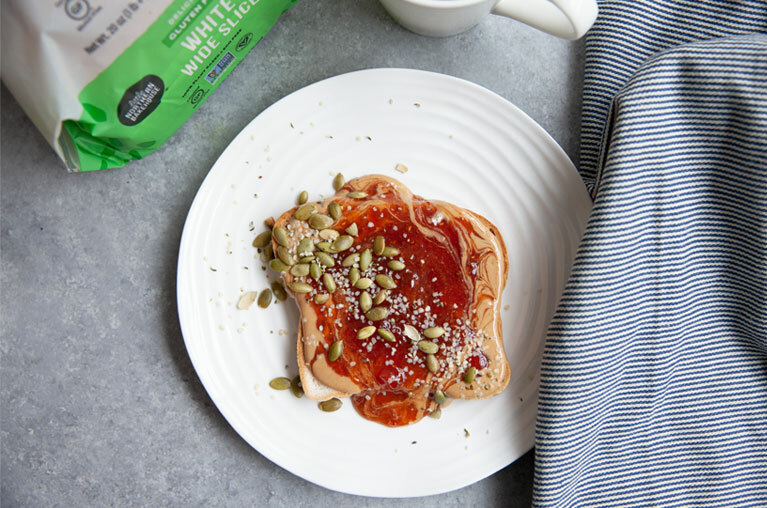 Remember, gluten-free is not synonymous with good-for-you (but our new sprouted breads definitely are). We’ve found that a lot of people who are sensitive to gluten or are celiac often tend to have other allergies, including to eggs, which lots of gluten-free companies use as a binder instead of gluten. Some people can also unknowingly find themselves reacting to GMO ingredients that are gluten-free. That’s why all our breads and buns are allergy-friendly and Non-GMO Project Verified. You might be surprised the next time you dine out how many gluten-free items are actually on a menu (or can be altered to be gluten-free). In fact, many restaurants now have an additional gluten-free menu with all those options listed. At home, experiment with new flavours of your favourite foods. Not sure where to start? Check out these Instagram-inspired snacks, tasty spreads, gourmet veggie dogs, or some classic lunch sandwiches. Looking for more inspiration? Check out why balance is the best diet hack or head to our Instagram.